It's very, very hard for well-fed Westerners to get their heads around the reality of malnutrition and starvation. Seriously malnourished and starving people do not rise up and revolt. They lie down and seriously consider whether they can afford the energy to get up and complete any given task. Chronically malnourished kids don't grow to their genetic potential and readily succumb to illness. Common knowledge has it that Vietnamese people are genetically pre-disposed to be short, with a delicate bone structure. And when I first visited Vietnam in 1995, that certainly appeared to be the case. Everyone I saw was short and thin. When I returned to Vietnam, landing in Da Nang ten years later, my first thought was that the people of Da Nang must be of a different ethnic background than those I had met previously in Nha Trang and Saigon--their faces looked quite different from those I recalled from my earlier visit. It finally dawned on me that these Da Nang residents were not emaciated and so did not look "classically Vietnamese!" A lot of well-off people in the cities these days are quite chubby and their kids are tall and not "delicate" in appearance at all. However, most Vietnamese over the age of 25 understand hunger in a visceral way and their bodies bear the legacy of chronic malnutrition. Let me tell you about my young friend and co-worker, Trang. Trang grew up, along with her six siblings, in a hard-scrabble, cashless farming family. The "soil" on their little farm is sand and the nearby river is salty because it's so close to the coast. So, unlike areas further inland, diverting river water to irrigate their community's rice fields is not an option. That means that some years their rice makes a marginal crop and, in especially dry ones, it fails altogether. The only free and reliable source of food for this family of nine was yams, supplemented at times with home-grown pumpkins, a little bit of purchased rice for the babies, and some locally produced sea salt. That's it. Amazingly, they've all survived. The six daughters have now left home to work elsewhere and only the young son remains to be cared for by his parents. I asked Trang if they ate chili, onions, fresh vegetables or fish with their yams and occasional rice. No, she said, when you're hungry and poor, you don't worry about taste, you're just glad to get anything into your stomach--even dry yams that catch in your throat until they're washed down with water. Interestingly, the opposite of ngon, the Vietnamese word for delicious, would not translate as "disgusting," as in English, but, instead, as "uninteresting." Yams and plain rice alone are just not that interesting but, to Trang's way of thinking, a hundred kilo sack of rice would be a real piece of food security. Trang says that a windfall like that, eaten half and half with the yams they had dried, stored and then boiled could last a family of nine for a couple of months. Add some nuoc mam (fish sauce) or soy sauce and it even starts to taste "interesting." I'm telling you this because it seems like there's a disconnect between the message that I'm getting from knowledgeable people about the imminence and totality of the impending collapse, and the fussing and fretting I discern from some "doomsday preppers" about difficulty in affording freeze-dried, Mylar-packed "survival foods" and the like. Our orientation towards food and nutrition in America has us focused on protein, vitamins, "good" versus "bad" cholesterol, and striving to avoid "empty calories." However, it's calories that keep our bodies functioning and that give us the energy to do the things that need doing. Certainly, our bodies work better and our children grow bigger and stronger when we have optimal amounts of vitamins, minerals and protein in our diet--but all of that is irrelevant if your body is consuming itself just to maintain its basic physiological functions. It's a given that 307 million Americans are not going to immediately become successful hunter-gatherers when the SHTF. And even the most knowledgeable would-be back-to-the-lander is not going to enter this daunting new phase of history with a full larder and the assurance that every subsequent crop they plant will bear fruit. Thus the recommendation to stock up on food supplies sufficient to bridge you over to whatever comes next. Traditionally, in agriculture-based societies, the staple food item is a calorie-packed, readily storable grain or root crop. The Irish had potatoes; indigenous Americans depended on corn; French and Italian cuisine is based upon wheat; and, here in the coastal regions of Vietnam, we have rice--if we're lucky. Of all those crops that I just mentioned, I'd like to suggest that you consider rice for the core of your initial emergency food supply, for several reasons. First of all, it's much less problematic to store than any root crop. Secondly, the price of bulk rice at the moment is affordable. And thirdly, preparing rice for consumption is far less demanding than what is required for most any other grain. Bread baking with wheat, for example, necessitates grinding the wheat, access to a leavening agent such as yeast, considerable time and skill, and an oven with reliably constant heat. By contrast, rice requires only a pot, a heat source, and a bit of water. Actually, the third electrical item--after an electric light and fan-- that every Vietnamese family purchases when they get the cash is a rice cooker. This one simple, relatively cheap device makes cooking rice absolutely brainless--just rinse the raw rice, add some water, close the lid, and push the "cook" button. The rice is ready in about 15 minutes or so when the "cook" button clicks off and the cooker switches to warm mode. In fact, if you have rice left over from one meal, you can add a bit of water, hit the "cook" button again and you've got hot rice ready for your next meal. No electricity? Switch over to a pot on your gas burner--or your charcoal or wood fire. Slice up something else--onions, chicken, a little fish--stir fry that in some cooking oil, and you've got yourself a pretty respectable meal. Still have left over rice? Next time throw the cooked rice in the frying pan with whatever else you've got and voila! --you've got fried rice. Throw the rice into a little broth made from whatever you've got--a bit of beef or some clams or whatever--cook it until it's absolute mush and you've got chao, the traditional food for invalids, children and toothless old people. I'm pretty sure that you don't live next to a rice paddy, but I'm willing to bet that trail mix doesn't grow on trees where you live either. If you're from the Americas, Europe, Australia or New Zealand, it's not likely that rice will end up being your staple crop in the long-term but, for that tumultuous transition time ahead, you could do worse. And Trang says rice is a LOT easier to swallow than boiled sun-dried yams! In Vietnam, when we have a disaster, it's generally a flood due to a typhoon or run-off from torrential rains in the mountains. 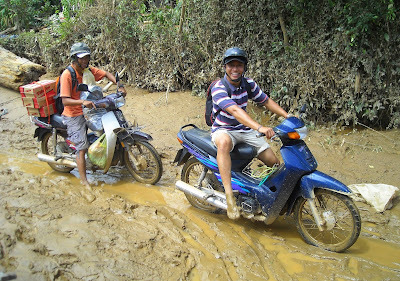 Let me qualify that: here in Central Vietnam, it floods every year. It's not uncommon for houses in some locations to get flooded chest deep annually. The BAD floods are the ones that come up REALLY high, REALLY fast, with little or no warning--the ones where folks are up in the rafters, chopping holes in their roofs to escape from the rising waters. Since almost all food here needs to be cooked before eating, this causes some considerable inconvenience when the family is spending a couple of days perched on tables or in the loft, waiting for the flood waters to drain out of the house. 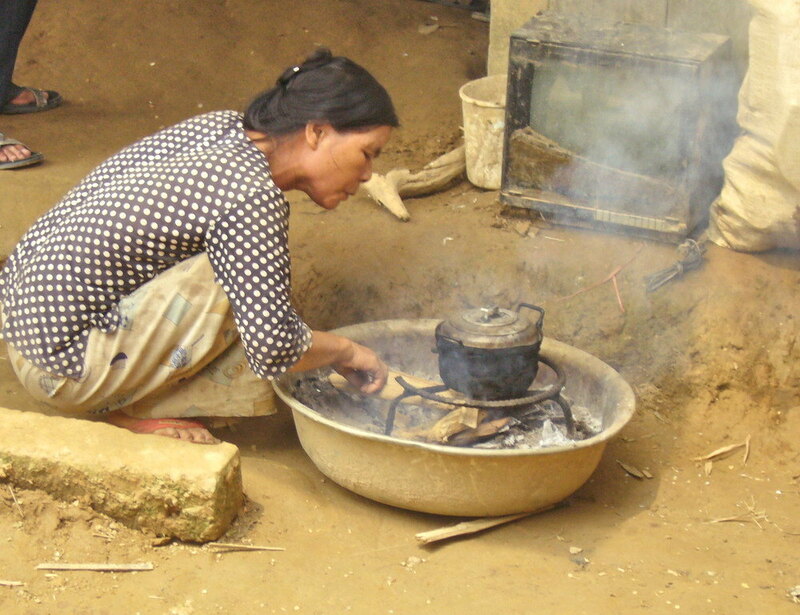 You can, says Trang, catch rain water from the roof and then cook VERY carefully with wood atop your table if you have some metal underneath. Better by far to have the ubiquitous Vietnamese disaster relief food: ramen noodles! Trang says the instant noodles are great: you can just add hot water to soften them or, in a pinch--you can eat them like a cookie, without cooking them at all. So I guess what I really want to say here is that your three months' emergency stockpile of food needn't simulate a typical Western diet. Keep it simple and just move on and focus on acquiring the skills, tools and human connections that you will need to invent a new life for yourself in that Brave New World which is yet to be born. Steady Footsteps volunteers speed relief supplies to victims of recent typhoon.